A cmdlet is a specialized .NET class that interacts with Microsoft .NET Framework objects. Each cmdlet acts as a single-function command that can perform multiple operations with these objects. Objects represent instances of the Veeam backup infrastructure: jobs, databases, restore sessions and so on. Each cmdlet has parameters that pass additional object data to cmdlet. Parameters can be either required or optional.You will not be able to run a cmdlet without specifying the required parameters, while the optional parameters can be omitted. Parameters are organized into parameter sets that form a syntax of the cmdlet. Cmdlets and their parameters are named after the Windows PowerShell naming conventions. Veeam cmdlets are developed to behave like other Microsoft Windows cmdlets. This guide covers only basic information on how to work with Veeam Explorers cmdlets using Windows PowerShell. To learn more about Windows PowerShell, see this Microsoft article. The Get-Help cmdlet is a Microsoft cmdlet. You can use this cmdlet to get information on Microsoft cmdlets, as well as on cmdlets added with Veeam Explorers PowerShell modules. The online help for PowerShell on Veeam Help Center always provides more accurate information than the help reference that is integrated into the product. The online help is updated regularly and contains all fixes based on customers feedback. To get full details about the necessary cmdlet, run the Get-Help <cmdletname> -full command from your PowerShell console. The Get-Help command will return a whole set of parameters that are available for the cmdlet and an input type for each parameter. To restore SharePoint items backed up with Veeam Backup for Microsoft Office 365, you must provide either of the following required parameters. The parameter that you choose depends on the scope that will be used to restore items. Specifies a backup job that will be used to restore items. The Start-VBOSharePointItemRestoreSession cmdlet will start a new restore session. You will be able to use this session to restore items from backups created by the specified job. Accepts the IVBOJob object. To get this object, run the LINK cmdlet. Specifies a restore point that will be used to restore items. The Start-VBOSharePointItemRestoreSession cmdlet will start a new restore session. You will be able to use this session to restore items from the specified restore point. Accepts the RestorePoint object. To get this object, run the LINK cmdlet. Specifies a OneDrive organization whose items you want to restore. The Start-VBOSharePointItemRestoreSession cmdlet will start a new restore session. You will be able to use this session to restore items from backups created for the specified organization. Accepts the IVBOOrganization object. To get this object, run the LINK cmdlet. Specifies a Veeam Backup for Microsoft Office 365 server that backed up items you want to restore. 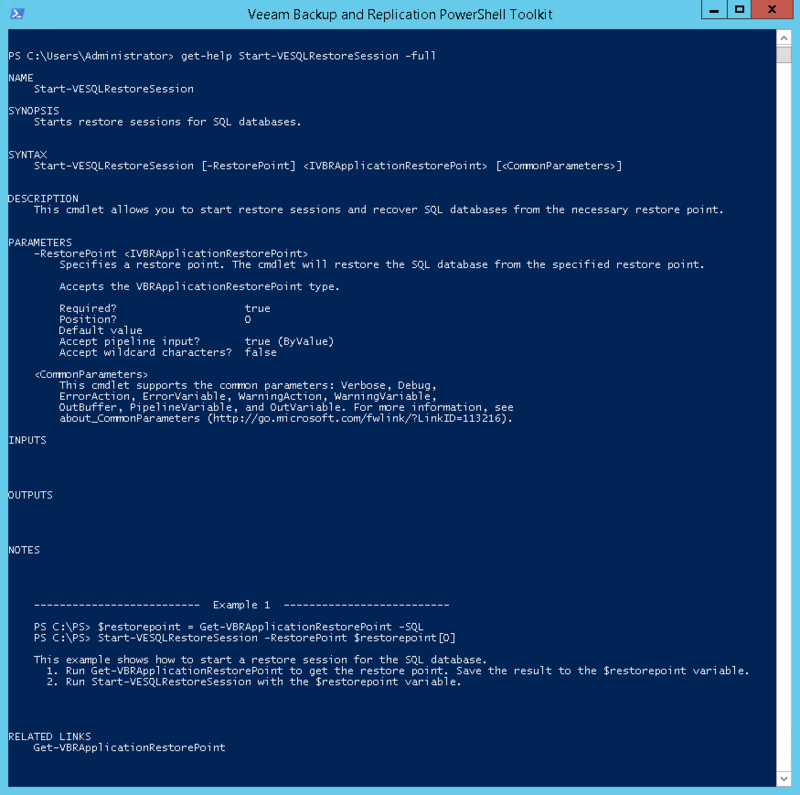 The Start-VBOSharePointItemRestoreSession cmdlet supports Microsoft PowerShell common parameters. For more information on common parameters, see Microsoft Docs.